Mother Teresa was a Roman Catholic nun. She devoted her whole life to serving the poor and destitute around the whole world. There are many people who for whom Mother Teresa is a role model. If you also love the working of Mother Teresa and 12 draw a pencil drawing of her then you will definitely love this tutorial. Hair in this tutorial we are going to instruct you about "How to draw Mother Teresa Face pencil drawing step by step?" Along with the tutorial on Mother Teresa face pencil drawing here we are also mother Teresa you should know. 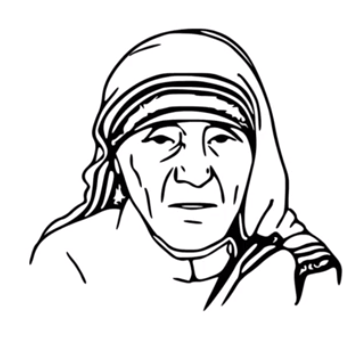 Nickname of Mother Teresa was Saint Teresa of Calcutta. She was born on 26th August 1910. Her nationality was Albanian, Indian. She was famous for humanitarian and Nobel Peace Prize. Completing the age of 87 she died on 5th September 1997 at Kolkata. She was also the founder of Missionaries of Charity. If you want to draw Mother Teresa face but don't know how to start, then the below-given tutorial will definitely help you out. In this tutorial, we have given step by step instructions for completing the Mother Teresa face drawing. After going through the above-given tutorial you will definitely surely be able to Draw Mother Teresa Pencil Drawing Step By Step. If you like the video then please hit the like button given below. Furthermore, to get all the latest updates directly in your mailbox you may subscribe to the free mail service by hitting on the subscribe button. If you are having any sort of suggestion of views regarding this tutorial then you may mention your comment in below-given comment box. We will be glad to hear from you.